2001 was the first year back for the Triumph Bonneville after having been off the market for decades. An interesting fact about the 2001 models is that it was the only year the Bonnevilles imported to the U.S were produced in the U.K. 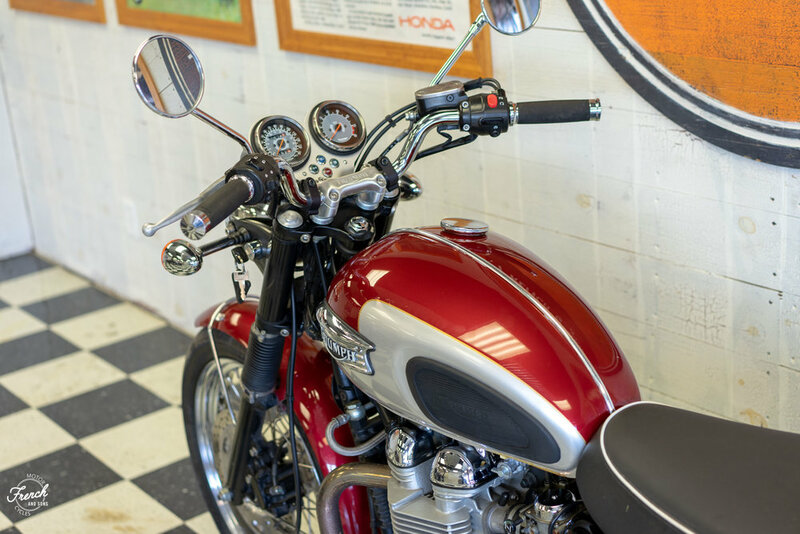 Triumph did a brilliant job at creating modernized version of the classic twin. 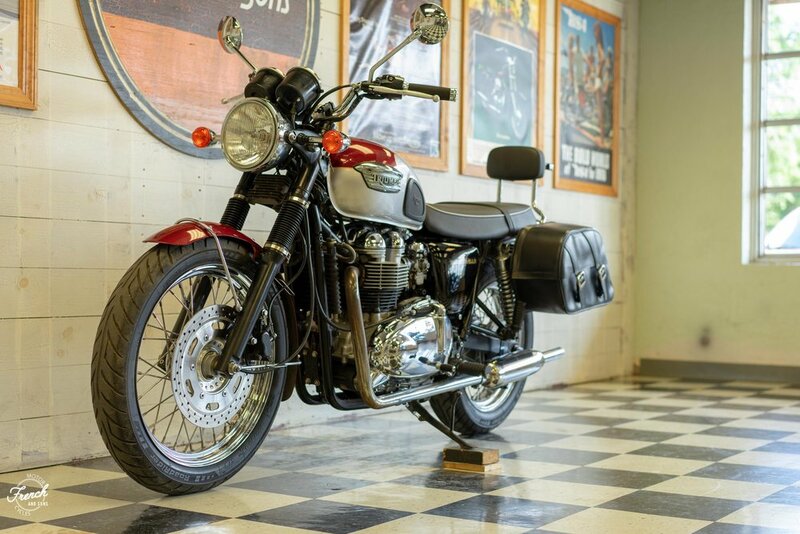 It features a 790cc twin using a 360 degree crank to give it the classic British twin feel. The motor produces a claimed 61 horsepower at 7,400rpm and 44 ft/lb of torque at 3,500rpm. Interestingly is that at 2,750rpm and up the motor uses 90% of it peak torque al the way to redline. The bike utilizes a five-speed transmission. In 2001 the Bonnevilles were offered in two color combinations, Forest Green and Silver as well as Scarlett Red and Silver, this obviously being the latter. The bike weighs 451lbs dry and has a seat height of 30.5in. This particular bike has 30,674 miles and has just recently been serviced here at French and Sons. It also has several Triumph accessories including: saddlebags, a passenger backrest, comfort seat and the speedo/tach package (stock bikes came only with a speedometer). Other additions include a 19-tooth front sprocket (lower RPM at highway speeds), Dyno-Jet high-performance carburetor kits and opened up slip-on exhaust making the bike sound almost identical the Triumphs of the 60s and 70s. This bike is ready to ride and is looking for a great new home. 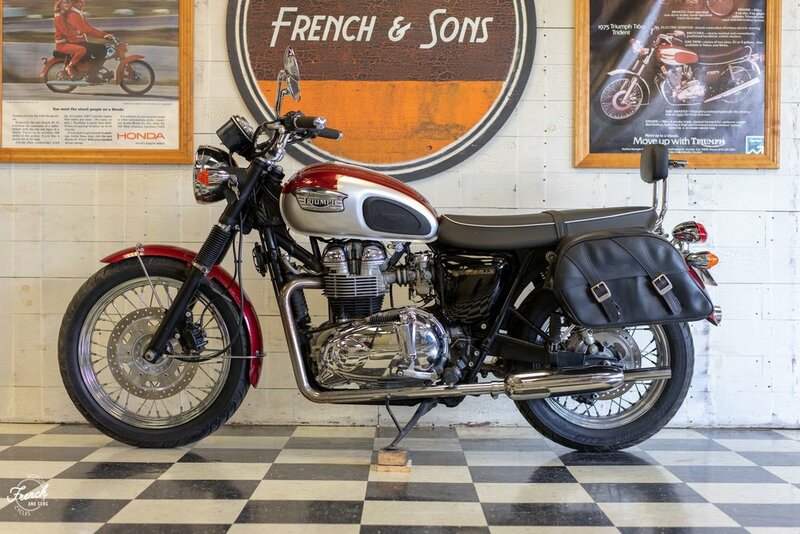 ** All motorcycles for sale at French & Sons Motorcycles are on consignment. All sales are customer-to-customer.